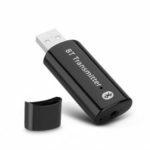 This extremely portable, lightweight wireless audio transmitter & receiver is an ideal wireless audio solution for a wide range of situations and uses. 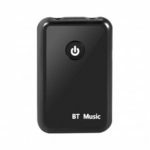 It can wirelessly stream audio from your Bluetooth-enabled device to wired devices or stream audio from your non-Bluetooth home stereo system to Bluetooth headphones or speakers. 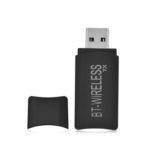 Wirelessly streams audio from your non-Bluetooth TV, home stereo system, or CD player to your Bluetooth headphones or speakers. Wirelessly streams audio from your Bluetooth-enabled phone, tablet, or computer to your wired stereo, speakers, or headphones. 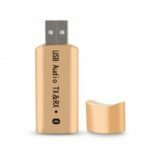 The KN320 just 18mm (0.63 inch) across and weighs only 18g (0.63oz), but has got powerful wireless audio streaming capabilities. Slip this transmitter and receiver into your backpack or laptop bag and take it on-the-go without the slightest effort. 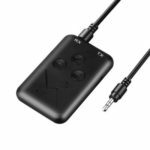 With the included 3.5mm cable, this receiver transmitter adapter can widely be used on your computer, laptop, home stereo system, headphone, smartphone, Mp3 player, CD player, etc. If the device has been in a mode for a long time, it needs to be re-energized twice to switch to another mode.b. If the device has just switched mode, you want to immediately switch to another mode, you only need to re-energize once.